Japan is one of the most contradictory countries you will ever visit. On the one hand, you will see modern buildings and smart technology everywhere, but on the other hand, the traditions are ancient, and you can still go to old tea houses for a tea ritual. Nevertheless, these contradictions are what makes Japan so fascinating. The people are always polite and welcoming, the food is delicious, and there are a lot of attractions that you can enjoy. The ‘Land of the Rising Sun’ is stunning, especially if you leave the big cities. The hot springs, the mountains, and the culture are both exciting and puzzling at times. Take your time and visit all corners of Japan. You will discover something new in every region. Before traveling to Japan, you need to make sure that you have all the documents you need. Lucky for you, Japan’s visa policy is lenient, and 68 nationalities can enter the country without a visa. The maximum allowed stay is 90 days, but some nationalities can get an extension for up to 6 months. Of course, not everyone can stay for the same period of time. It differs from 15 days to 90 days, depending on the nationality. All the other travelers are required to visit the nearest Japanese diplomatic mission and apply for a visa before departure. Learning in which category you are is easy. You have two options. You either read Japan’s visa policy, or you use iVisa’s Visa Checker. The second option is more convenient. It does not involve as much reading. All you have to do is select your country of origin from the drag-down menu on the left and put Japan as your destination on the right. If you are not required to get a Japan visa, you are good to go, but if you do, the Visa Checker gives you a list of embassies that are near you. 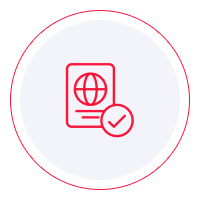 iVisa does not process visa applications for Japan because its government does not issue electronic visas. Not yet, anyway. However, that is scheduled to change by April 2020. Until then, all we can do is provide information. That is why our support service is at your disposal 24/7. Before you go to the embassy to apply for your Japan visa, you need to learn about the requirements. You can find a lot of information online, although we recommend that you contact the embassy itself and ask your questions there. The information online is not always the most reliable, and you do not want to waste time going back and forth to the embassy. Nevertheless, what we can tell you is that you need to have a valid passport that does not expire for another 6 months from the date of arrival in Japan. For further information, contact the diplomatic mission. While we cannot help you get your visa for Japan at the moment, when electronic visas are available, we will do our best to take care of it for you. In the meantime, we hope that the information provided above is helpful.